Your IBM i platform is an essential part of your business – is yours operating as it should? From day-to-day communication to complex reporting, your IBM i platform enables almost every function you need to produce, distribute and run your company effectively. And, in a manufacturing industry dependent on repeatable, scalable processes, even slight inefficiencies can lead to major losses over time. To avoid these inefficiencies and keep your platform running strong, you need to regularly diagnose the health of several key components. Does your IBM i platform align with your company’s needs and goals? Does your backup and recovery strategy provide you with the speed, security and peace of mind you need? Does your system always perform in a way that meets your users’ daily needs? Are your hardware maintenance processes healthy enough to keep your platform running strong? For each of these areas, you’ll answer a few, more specific questions that will help you to determine your needs. At the end of the assessment, you’ll be recommended a course of action based on your answers. Whether your IBM i platform is running strong or in need of immediate attention, you need to know! 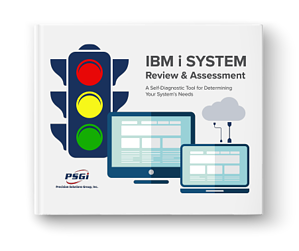 To get a good handle on your system health, download our IBM i System Review and Self Assessment today!